Good morning, I promised some Five Star the other day and so here we go! I've picked up a few Biggios from the set this year, as there is no base card of Bidge but there are plenty of autos! So the base autos are out of /333, while the "rainbow" variation is /25. I picked up a Silver Signature "Silver" parallel out of /25 as well. I was really excited about the book quad relic auto out of /49 though. Again, picking these up for a fraction of the cost of a box of this product. Today we find out of Biggio makes the HOF, and frankly there are already some idiots who have shown just how ignorant they are as sportswriters who say he doesn't deserve a vote. Especially that one moron who said the only deserving candidate this year is Jack Morris. Seriously, they've got to take this out of the hands of the sportswriters, they've shown year in and year out that they are a bunch of petty morons who hold grudges for imaginary reasons. But I digress.... have a great day everyone! He'll get in next year, 2 votes ridiculous! Wow! Those are all awesome! One Heck of a day at the LCS... Another BOOK! 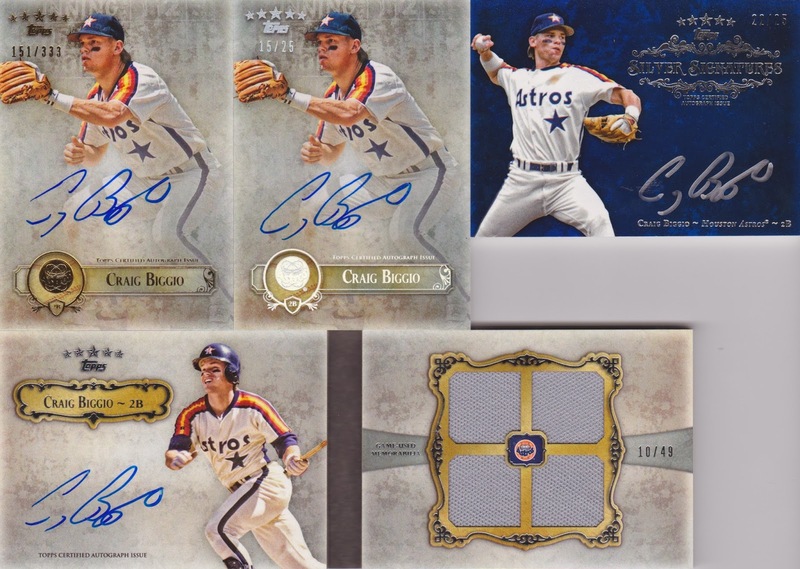 One More Biggio Five Star!